When two families try Softsoap® Brand Fragrant Foaming Collection Hand Soap for the first time the results are surprisingly hilarious and adorable. I can’t believe what she says at the end! LOL! Click play and then click the cog settings wheel. Choose 720 under quality to view in HD. Softsoap recently challenged me to try their new Fragrant Foaming Collection and become scentspired! Scents inspire feelings, experiences, memories, and images. I thought it would be a lot more fun to do this challenge with some friends, and therefore asked my friend Kathleen’s family to join us in taking the Scentspired Challenge. The first thing that surprised us was how foamy these soaps are. They are crazy foamy—and we liked it! Hand soap that smells good is important to me. Period. I decorate my home and surround myself with items that take into account all five senses. When I entertain, I want to greet my guests with yummy food, beautiful decor, good background music, and pleasing smells. Life is made richer by the details, and as silly as it might sound, choosing a good bathroom soap is an important detail that makes everyone feel pampered. Maybe it’s because washing our hands is one of the few times of day where we’re alone, unplugged, and quiet. I want those little moments to be as pleasant and spa-like as possible. I want my hand soap to smell heavenly, feel good, come out of the dispenser easily, and clean well without drying my skin. And if you can make all of that happen for me in an affordable cute bottle, then all the better! Fragrance is also a powerful inspiration for home decor, a “scentspiration” if you will! I created the following style boards based on how each of the Softsoap scents made me feel. I then chose room inspirations based on the essence of each scent. It was such a fun challenge! This soap smells amazing and works great in the guest, or master bathroom. 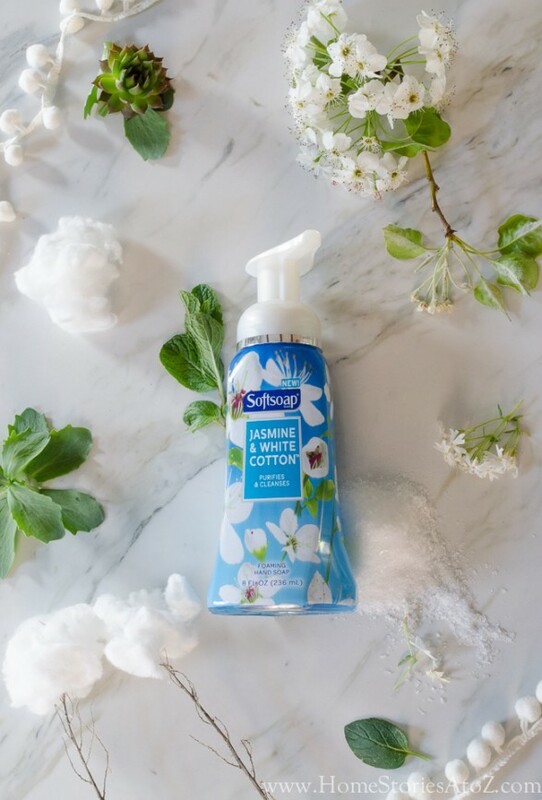 The smell brings to mind blue skies, lush greenery, fluffy flowers, and billowy white cotton. It is an elegant yet approachable scent. I picked this gorgeous farmhouse kitchen as my Jasmine & White Cotton scentspiration! It embodies everything I love about casual elegance, and I can almost smell the jasmine in the air when I look at this clean and crisp image. 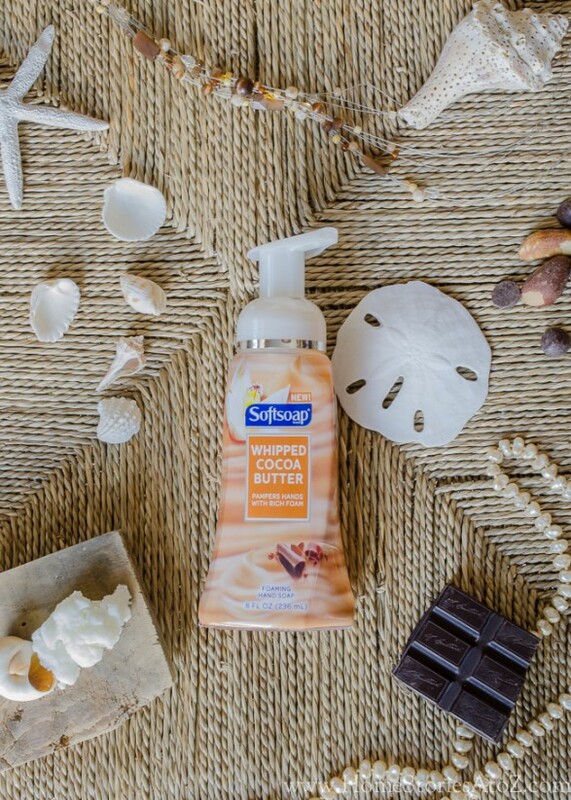 Softsoap Whipped Cocoa Butter smells like a delicious mix of chocolate and the beach! This was a hit–especially with the kids. I was scentspired to put together a style board filled with neutral tones and natural textures. The smell of this Softsoap reminded me of cozying up on the couch, with a cup of hot chocolate, in a beach house, on a cold winter’s day. The smell is warm and inviting. Lemons and limes always remind me of vacationing in the tropics. 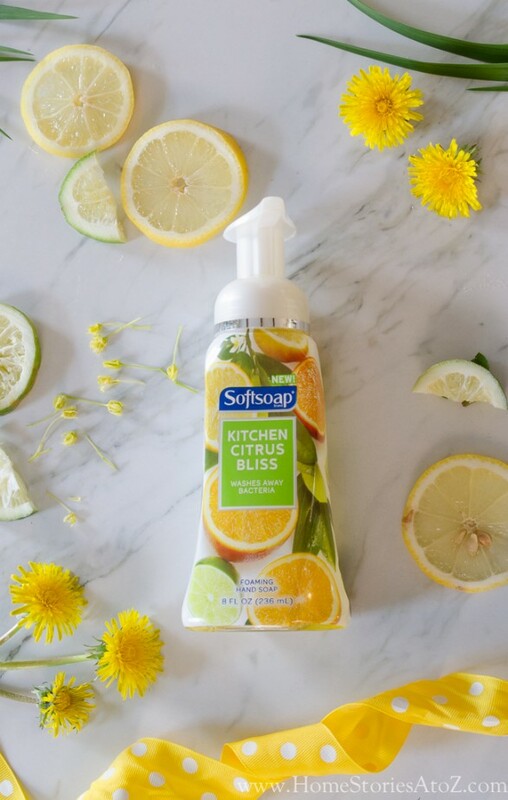 Citrus is such a fresh and clean scent and is perfect for the kitchen. My scentspiration image for this scent is a crisp white dining room with fun pops of color. I like spaces and scents that draw you in without overpowering the senses. This room has the perfect punch of citrus color that keep the eye moving without inundating you with stimulation. Kitchen Citrus Bliss is vibrant and inviting. Inspiration is all around us! I hope you feel scentspired to embrace all five of your senses and make your home an inviting retreat for you, your family, and your guests. Would you like to try the Softsoap® Brand Fragrant Foaming Collection Hand Soap for yourself? Simply leave a blog comment letting me know your favorite scentspiration image for a chance to win. Thanks Softsoap for sponsoring this post and challenging me to try the Softsoap® Brand Fragrant Foaming Collection Hand Soap ! All thoughts, ideas, and opinions are 100% my own. I’ve never tried jasmine and white cotton Softsoap. I bet it smells better than the citrus one. I saw these for the first time in the store last week and picked up the citrus one. I love the smell! Cute video Beth! Ha! Can’t say that I have. LOL! Thanks for stopping by and visiting me! You guys are so funny! I love that you included your pomeranians in the video. I would love to try the chocolate beach one! They all sound great! I would try the Jasmine first! I agree with you about just using pops of color when using bright citrus colors. An entire lime-colored room can be a bit much! Fun post. I liked the crisp white dining room image. 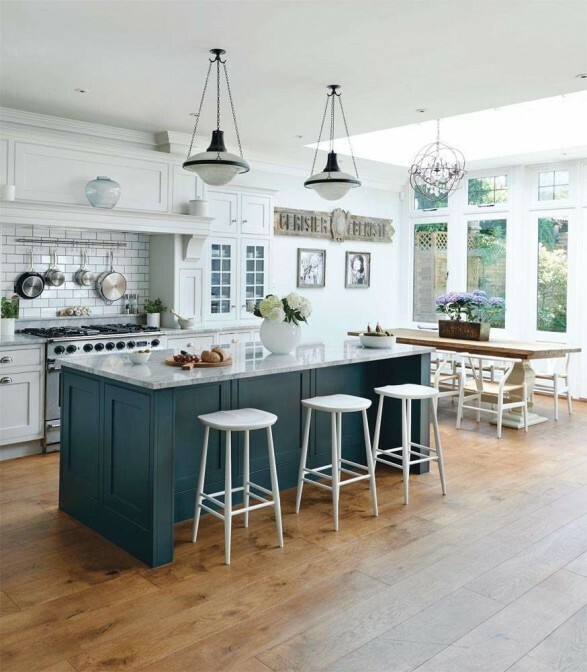 Love that gorgeous kitchen you picked that reminded you of the jasmine soap! I’d love to try out these soaps. Thanks for the giveaway. This was so clever and cute! I’m not usually a fan of Softsoap but maybe I’ll give them another try. Love the scentspiration pictures! Yes, these are much more high-end feeling in texture and smell. I think you’d like them. Ha! I loved, loved, loved the video! So cute! I need to get my hands on some of that whipped cocoa butter Softsoap! I have their Wild Basil & Lime hand soap in my kitchen and bath…. smells fabulous. I’ve never tried the Wild Basil & Lime. I’ll have to try that one! Thanks for visiting!